The South-Central area of Texas isn’t exactly known for bitterly cold temperatures, particularly when you compare the area to other states throughout the country. Our evenings, however, are nothing to scoff at when the heating season comes, and as such it’s vital that we have efficient and effective heaters in our homes. But what if you have a San Antonio, TX furnace, and it’s not up to snuff? Whether you hear odd noises coming from your heating system, detect a strange odor, or simply find that your furnace isn’t performing as well as it once did, there is no problem too big or too small for our team—and no problem that you should just simply ignore. Dealing with furnace and heating problems can be a hassle, but it doesn’t have to be a chore when you count on licensed professionals to handle your heating repairs. In the meantime, we’ve shared with you below some of the most common furnace problems we get calls for. There probably isn’t a homeowner in the country today who doesn’t want some easy way of saving energy in their homes, and thus saving money. We all look for methods of energy savings—but unfortunately many individuals thing the only way to truly save energy is to just not use their appliances as much. Unfortunately when you live somewhere as warm as San Antonio is for the majority of the year, this isn’t exactly doable! And it doesn’t need to be. Do You Know How to Pick the Right HVAC Contractor? Whether you are looking to schedule maintenance for an air conditioning unit or you need to have a new heating system installed, it’s understandable that you want the peace of mind that comes with hiring an experienced and well trained professional to do the job. But how do you tell a good HVAC contractor from a poor one? Posted in Air Conditioning | Comments Off on Do You Know How to Pick the Right HVAC Contractor? Last week, we explained the importance of changing your air filter, and offered some guidance on how to do so. 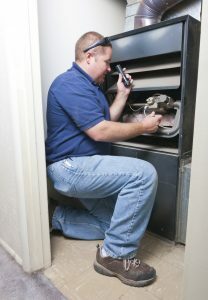 This is one HVAC maintenance task that not only can you do on your own, you should be doing on your own. Especially considering that you typically only schedule professional maintenance once or twice a year, and your filter must be changed much more often than that. Changing your air filter is not the only maintenance task you can do yourself though. While we don’t typically recommend DIY-projects when it comes to working on your HVAC system, there are some simple things you can do throughout the year to help your system work effectively and efficiently. Keep reading to learn more.